Now bringing survival into your life is simpler and more convenient than ever, with this deck of cards that takes readers through the basic skills and techniques specific to survival. 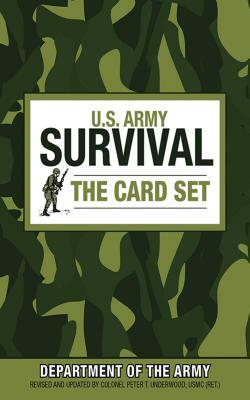 U.S. Army Survival: The Card Set offers an informative and helpful approach to outdoor survival, whether for pleasure or in the case of an emergency. Each card features a full-color photograph illustrating the different lessons to prepare you for whatever nature has to throw at you, along with clear and simple instructions. This conveniently-sized guide emphasizes the importance of being prepared for anything and everything from learning how to identify a poisonous reptile or plant, to making a safe shelter to spend the night. You will not only be prepared for what may happen, but you’ll have the information to handle any situation that can ultimately save your life. The U.S. Army is known word wide for its survival tactics, and with this handy card deck, you will be able to carry around all the information that trained soldiers live their lives by. You’ll always be prepared, and ready, willing, and able to handle any survival situation. So grab your backpack, put on your hiking boots, and head out to enjoy the great outdoors…the U.S. Army way!